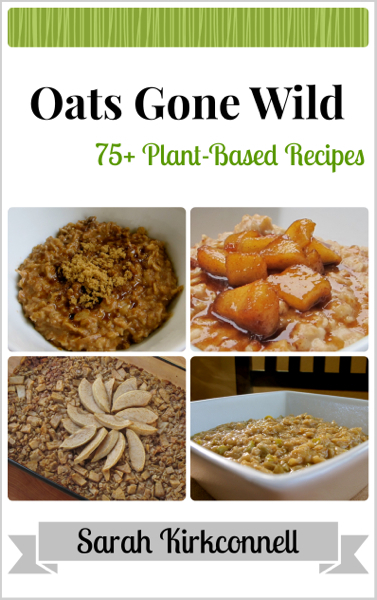 has 75+ plant-based recipes, featuring a mix of stove-top and baked oatmeal. With an interactive front index, it is easy to click through to the recipe you want to try. It is in digital format, for $4.99, via Amazon (as always, Kindle books do not need a Kindle to read! You can use their many free apps for phones and tablets, or read on computers).
) with “gluten-free” in the title and you will get someone leaving you a 1-star review claiming the author doesn’t know anything. You can’t make everyone happy…..so while the majority of the cookbook is GF friendly, I didn’t need any more hate. Oats prepared right can be tasty, healthy for you and even downright delicious! – from yes, Bob’s Red Mill. They are not gluten-free though, so beware of that. Our local Costco has them in stock as well. I have often shied from steel-cut oats due to the long cooking time. Just not my thing. But these cook in the same amount of time as old-fashion rolled oats. So we tried out a new recipe for baked oat cups. Add oats to a mixing bowl, cover with water and let rest for 4 to 5 hours, covered. Drain off water. Preheat oven to 375°, liberally spray or oil a non-stick 12 count muffin tin. Whisk Ener-G powder and warm water together, let rest for 5 minutes. Stir oats, cranberries, sunflower seeds, flaxseed, half the cinnamon, nutmeg, and salt in the bowl. Whisk the Ener-G mix, coconut milk and Sunbutter together till smooth, pour over oats and stir well. Divide between the prepared muffin tin (it will fill the cups up). Take the remaining cinnamon and toss with the apple, divide evenly over the top of the cups. Bake for 20 to 30 minutes, until golden and set. Let cool a bit before serving, or for breakfast in advance, pop out and stash tightly covered in the refrigerator. Reheat in the microwave for about a minute, serve with additional maple syrup over the top. Makes 12 muffins, with 2 muffins for a serving. PS: Thank you SO much for helping support me while I wrote the book. Kind words mean so much! This book is my 4th full-length cookbook and I hope to do so many more! Congratulations on finishing your book! It sounds great, as do these oatmeal cups!